On the eve of great news for my project, I want to share with you a bit of what it took to envision and create Loss and Beauty. Last month, while teaching at the Pacific Northwest Art School, I was asked a great question. After giving a successful presentation about the work and my path to bringing it to where it is now, I was asked, “what was the most difficult thing you had to overcome during this six year journey?” I quieted myself for a moment and then let loose the word that floated up – fear. Having fun in Vinales, with Kari Wehrs. The scene of Revolutionary Square through a rainy side curtain. ‘pears on a window’, Sam Abell. Get square to your subject. Hoping to catch a shift. Life on the streets, big and small moments. What privacy looks like in Havana. Kitchen still life, seeing gardens. Skip during our first presentation. Skip donating five Walker Evans prints to Fototeca, our hosts. The morning catch on the Malecon. From the lighthouse at El Morro Fortress. A boxing club in Old Havana. Interior at the Afro-Cuban Dance practice session. Greg and Sam and their fruity drinks. I don’t like painting all my fellow photographer’s with such a broad brush, but the point is well taken. I don’t use flash for two reasons: first, horses don’t like it and second, I don’t use it well enough to make it seem like there is no flash. In other words, I prefer natural light. I like the challenge of discovering a way to use all the light available. Very often, this means finding solutions to difficult lighting situations. 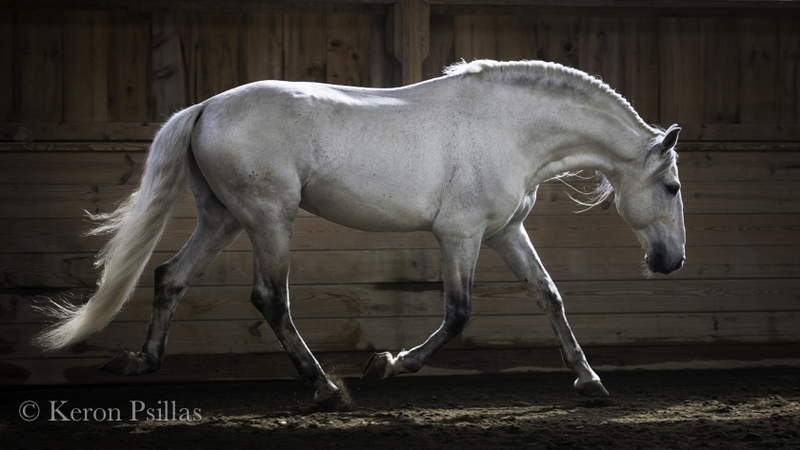 It’s hard to put a horse in a soft box type of environment and then ask them to be dynamic. It can be done, but why not learn to see the beauty in light we are given? Seeing deeply, and truly learning how our cameras see light will create confidence and boldness. Shoot into the sun? Why not? It can be magical! No light? Get a light horse and shoot the movement. There is more light there than we think! Bright sun in the middle of the day? Find some open shade or shoot a sunny portrait. Better yet, look for some bounce light and make a beautiful, softly glowing image. The point is, there are always photographic opportunities. My students keep me humble and stoke the fires of inspiration and creativity. Thank you for a marvelous two weeks! 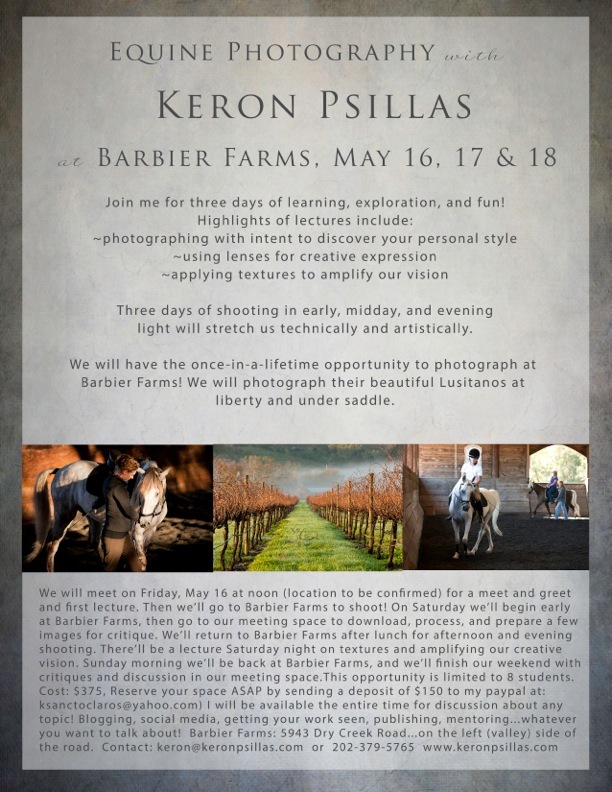 And a special thank you to Patewood Farm in New Jersey and Barbier Farms in California. The people and the horses in both locations made work fun and filled the days with laughter and good spirit! The winter rains have given way to the glory of spring. I’ve had the great luxury of photographing beautiful horses in flowers and dappled sun these last two weeks. It is marvelous to be out each evening in the woods and pastures after what seemed like interminable rain! Carlos Oliveira on Talisman, PSL. There is something about these cork trees (quercus species) that I love. I keep thinking that someone in a toga will step from behind one. Silly? Perhaps. But this landscape says ‘human history’ to me. 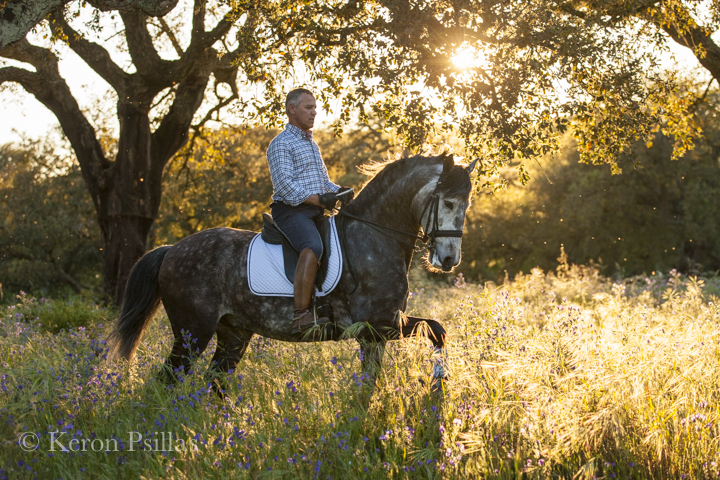 And for the last 500 years, the cultivation of the cork oaks has combined with the breeding and selection of the Lusitano to create a land and heritage that is Puro Ribatejo. And yes, I know….togas are much older than 500 years. But so is the cultivation of cork oaks here in the Ribatejo. And speaking of togas, here is an interesting fact: Julius Caesar made his fortune near here in Alcacer do Sal (by harvesting salt) and with this strength of fortune and his army, became Emperor of Rome. Enjoy the photos. I’ll be back this weekend with more, after the festival in Alter de Chao. I posted images from the South of France just last week. Many people emailed or commented (on Facebook and this blog) with kind and generous remarks. Thank you! I’ve also been talking to several of the students that I mentor who have voiced an interest in working with textures and layers. I’m posting the step by step process here to encourage you all to have fun and give something new a try! As always, I send my gratitude to Jill and Paul and Flypaper Textures for their passion to make great products (click on the box there on the right and you’ll see all their marvelous sets of textures). My disclaimer…I am not a photoshop instructor. There are many people who excel at this part of teaching, but I am not one of them. My intent here is to share something fun that might intrigue you. After I have optimized my image in Lightroom 5 I will choose Photo~Edit In~Photoshop CS6 (or 4 or 5…whatever you are working in). 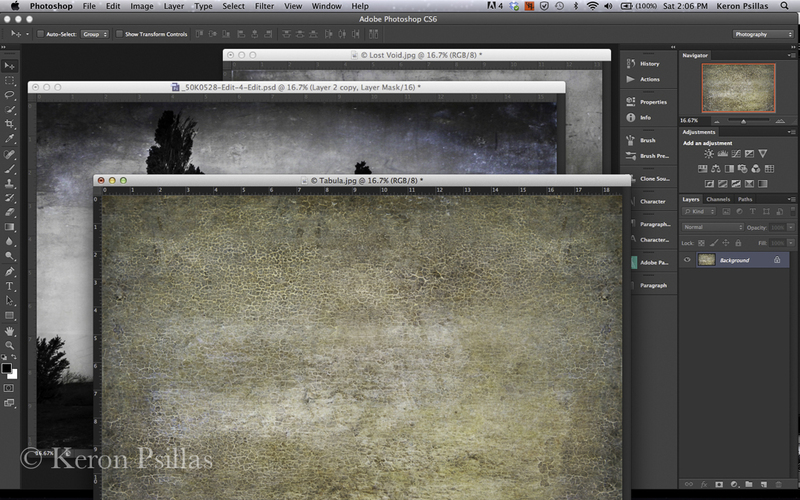 If I have opened my texture(s) file(s) from another source I will have a number of images open in Photoshop. For the purposes of this tutorial, lets go with the assumption that I have opened from another source rather than the plug-in (see note at end of post). If your images are all in the same bar and you want them to appear in separate windows (you do) then click on Window ~ Arrange ~ Float all in windows. Now you can move your images onto each other. 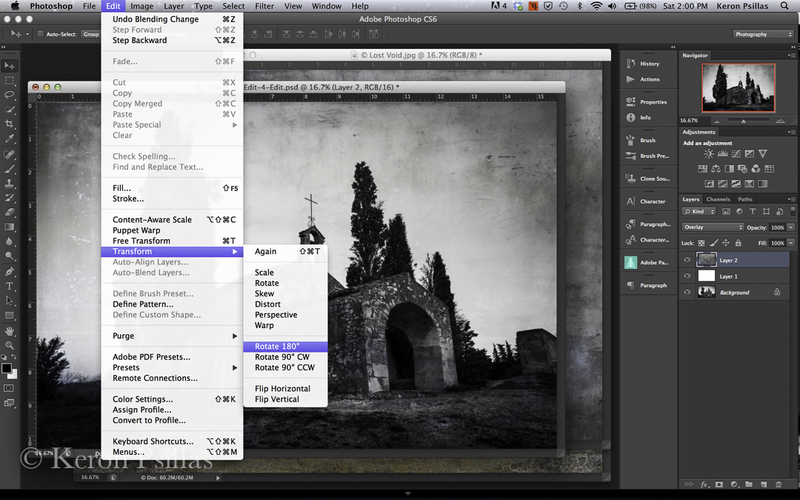 Click your move tool (at the top of your tool bar on right) and choose a texture to place onto an image. After you have moved it onto your image you will see that you have two layers. Perhaps your new texture layer is a different size than your image. Don’t worry. 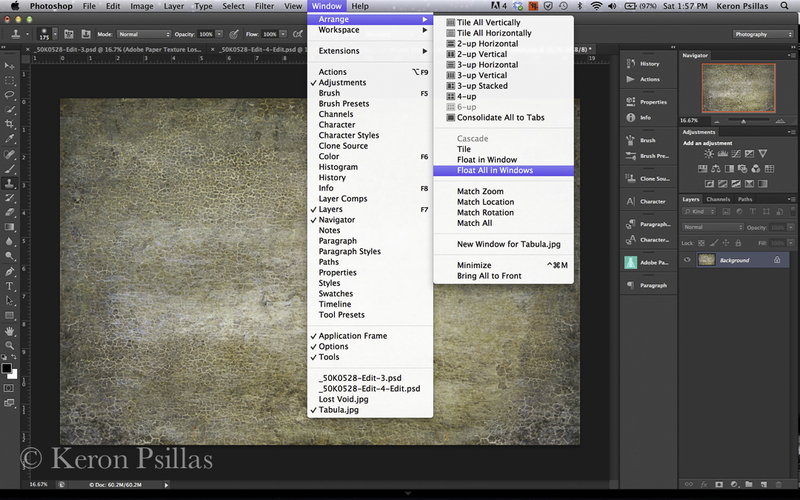 With your texture layer highlighted, choose Edit ~ Transform ~ Scale. Hold down your shift key and then resize by dragging a corner or side box to maintain your ratio. If you don’t need to maintain a ratio, simply grab one of the size boxes with your move tool and resize your texture layer to cover your image. After you have resized your image, click the CHECK MARK on the upper right to confirm your resizing. Now in your layers palette you need to choose the Blending Mode. The default is Normal. Click the drop down menu and you will see many options. I generally start with Soft Light or Overlay, depending on how I want the image to appear. 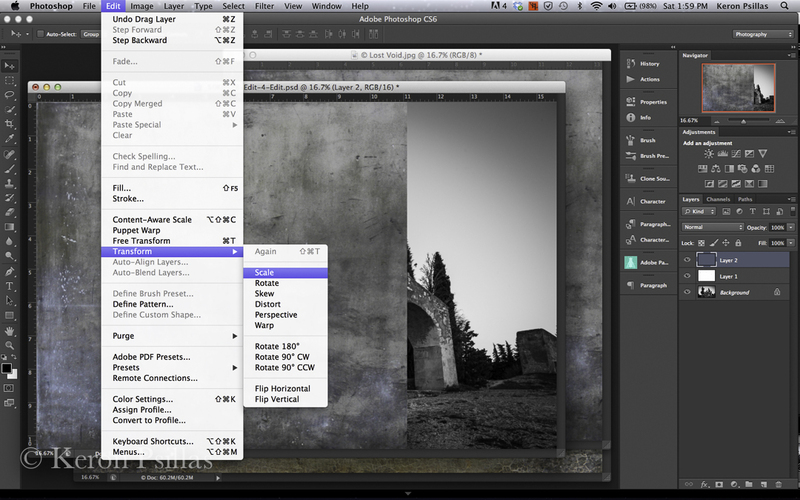 Try each the options in the drop down menu and go back and forth to begin to learn the subtleties. Perhaps you like the Overlay mode but it’s a little too strong? Move the opacity slider (just to right of Blending mode drop down box) left and fight to find the desired effect. 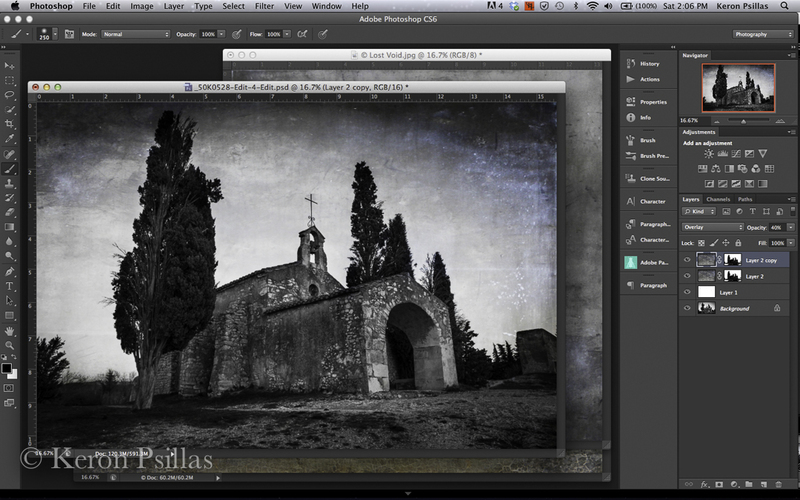 Perhaps you like the effect on some of the image but want to minimize it in certain areas? I use this a lot to block out the texture layer on faces, bodies of horses, or where the shadows and vignetting can be a little too strong. Go down to your bar at the bottom of your layers box (on right) and choose the mask overlay. It is the rectangle with the circle in the middle. This is where it gets really fun! Now you can ‘paint’ IN or OUT the desired effect. You have infinite control here simply by choosing the OPACITY of your BRUSH. Next, click Command~I (with your texture layer highlighted) to completely block out your texture layer. You will see your mask turn completely black and you will see only your original image in the window. Now we can begin to reveal the texture layer WHERE we want it and in WHAT STRENGTH we want it. Choose your brush tool from your toolbox. I generally start with 30% opacity on a fairly large, soft brush. (on the left in the tool panel) For finer detail work you will want a smaller, harder (less diffuse) brush. But start with a big soft brush. Here’s a key concept: BLACK BLOCKS, WHITE REVEALS. So down at the bottom of the tool panel on the left I will make sure I am painting with a WHITE brush IN MY MASK to reveal the texture layer (make sure the mask box is highlighted before you start painting). You can work either way, Paint ONTO your image with a white brush to REVEAL your changes, or paint OUT OF your image with a black brush to BLOCK the texture. I generally REVEAL the texture, slowly building up the effect. 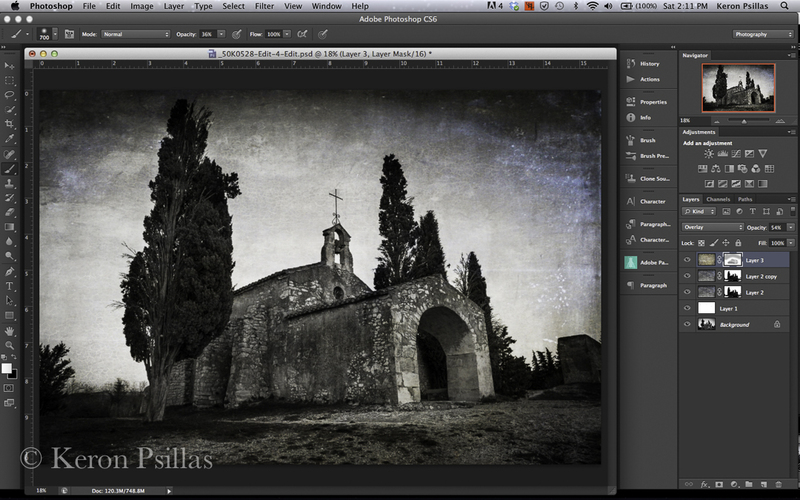 You can see by my layer mask in this screen shot that I have revealed ALL of the texture (100 percent) in the image except over the church and some of the tree. In the mask, the area that is black has BLOCKED the texture from showing through. Now I have duplicated that texture layer, which compounded the effect of the texture. When I duplicated the layer it also duplicated my mask. You can make changes here simply by highlighting the mask (clicking on it) and then using your brush to reveal more or block more of the effect. Remember you can lessen or intensify the effect of your brush by choosing your brush opacity. Or you can remove the duplicated mask altogether by clicking on it and dragging it to the trash can in the lower right corner. I like the more intense effect, but I want more depth in the sky, more of an aged feel. So I chose TABULA in my textures to layer on top. I resized the texture layer (outlined above), clicked the checkmark, and then after looking at it for a moment, I dialed the opacity of the texture layer back to my desired effect. Compare the next two images. Notice the difference in the image itself. This is what I wanted, but I needed to fine tune some areas in the image. So I added my Layer Mask, and started to paint again with a black brush this time to BLOCK the effect. I was careful to dial back my brush opacity so I could work slowly….feel my way into how the image wanted to be. See the next two images. The first image shows my BLACK BRUSH at 56% opacity. The second image shows my BLACK BRUSH at 36% opacity. Sometimes you have to go back and forth between white and black brushes, painting in then painting out changes. Sometimes you have to throw away your layer mask and begin again! I simply wanted to soften the effect in the sky and already dark corners, and really soften the effect on the stone itself. 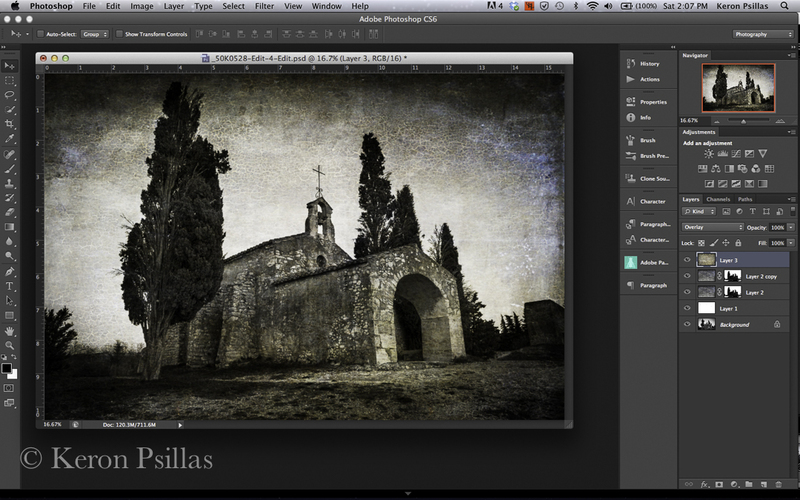 I chose TABULA because I wanted to echo the texture of the old stone. I didn’t need to add too much of the texture (just looking for the tone/color) to the stone. Then I walked away from the image! This is an important step. We can become emotionally attached to an image and a little bit ‘in-love’ with what we are doing. We need perspective, we need to cool our ardor a bit and then return to the image to check our work. I finished with the image below…you can see a tiny difference in the layer mask on TABULA. I let a little more of the texture come through on the stone. It added more of the tone and color I wanted. 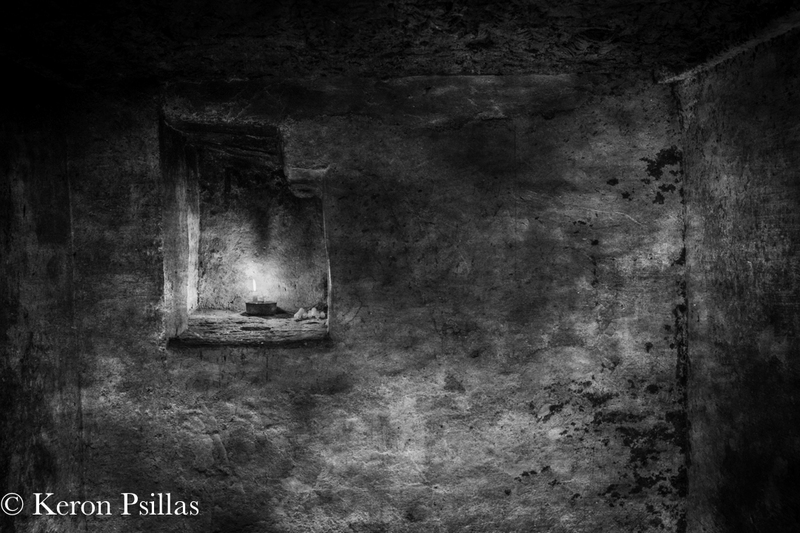 In this image of the Chapelle Saint Sixte near Eygalieres (Provence) France I knew when I was making the image that I wanted a more somber, mysterious mood for the photograph. The more you work with textures the easier it will become to feel your way into what the image needs. But I began with an intent. I photographed with the intent to transform the image and I carried that intent all the way through the processing. PS…if you want more information on texturing, click on the Flypaper Textures box there on the right hand side of my blog and see what Jill and Paul are up to! There’s a wealth of information on their site and blog. And if you are interested in having a plug-in that will keep your favorite textures handy, visit Dr. Russell Brown’s site for a free one AND some great FREE Flypaper Textures. Click on THIS LINK to download your own plug-in. It’s easy and a great timesaver. Be aware though, it only works with CS6. Just scroll down to find the Green T for the textures script on his page. Have fun! I went back to Companhia das Lezirias for an hour or so this morning to photograph more driving. It was pretty amazing to watch the precision, power, and speed! Congratulations to all the competitors. I heard competitors from Belgium, Spain, and Portugal being called to the piste…but I think I saw some French and German flags as well. If any of my readers know the participants, please pass along the link! And congratulations/parabens to Companhia das Lezirias for a beautiful venue and event. Last weekend I was in Chalon Sur Saone, France, to visit the Musee Nicephore Niepce. It was an extraordinary experience…made more so because it was completely unexpected. To be sure, I had planned to visit, but the unexpected part was the breadth of history and an incredible collection of contemporary photography. 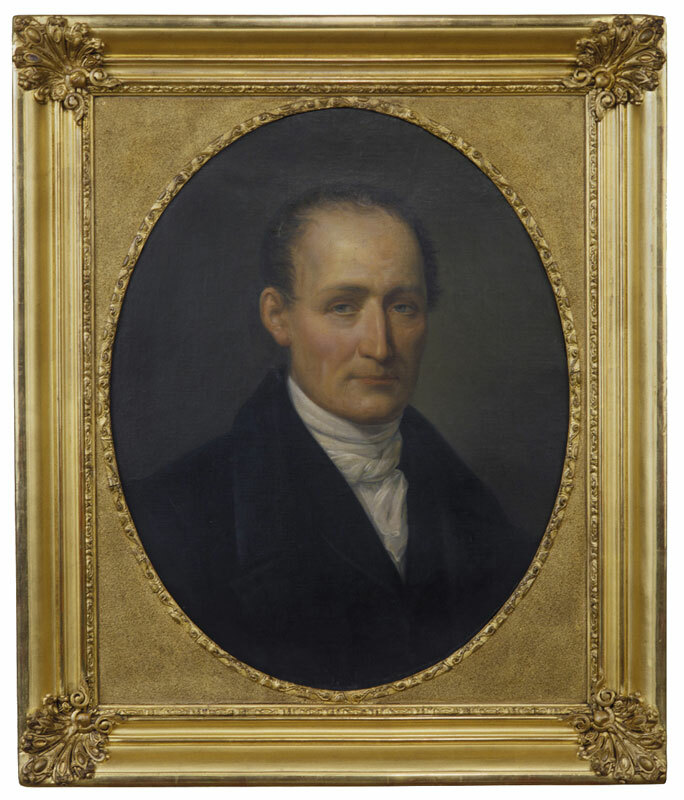 Click the link above to visit the site for the museum and learn all about Monsieur Niepce. In brief, he was the first person to fix an image on a photo (light) sensitive plate using a camera obscura. After several years of trial and error, he invited Monsieur Daguerre, a chemist, to join him in a partnership to develop this budding technology. Niepce died just four years into their partnership and Daguerre went on garner wide acclaim. 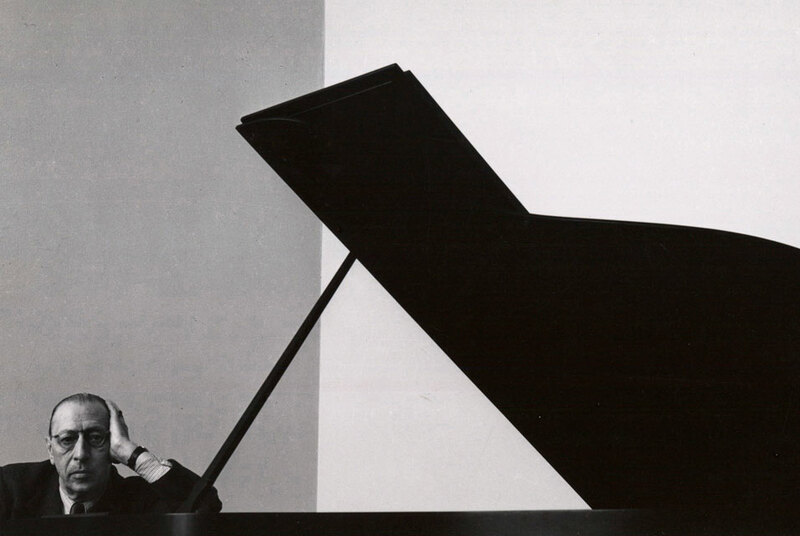 After deciphering as much of the history as possible (the exhibits are mostly in French), I turned a corner to be confronted with Arnold Newman’s great portrait of Igor Stravinsky. Turning left I saw that I was in a very large room with walls hung with images from the greatest photographers, living and dead. Hanging was a selection of photographs from Florence and Damien Bachelot, passionate collectors. Bruce Davidson, Mitch Epstein, Saul Leiter, Luc Delahaye, Cartier-Bresson, Andre Kertesz, Willy Ronis, Dorothea Lange, Lewis Hine, and so many more were in this one room. I was in heaven. It was one of those unexpected moments that was so perfect, so sweet, and entirely captivating. I spent the next several hours enthralled, and then in true American fashion, went to the boutique to buy gifts for other photographer friends! One of the things I encourage my students to do is to fill themselves with great imagery when they are not photographing. Attend a ballet, an exhibition, take a walk in the woods, browse a great book…life is enthralling and the creativity and genius available to us knows no bounds. So this last weekend I was busy feeding my soul, my brain, and expanding my visual literacy. Happy girl. “If the beautiful were not in us, how would we ever recognize it?” ~ Ernst Haas. It couldn’t be too long until I had a post about horses, right? Today I photographed some preparation for the Iberic Cup championship in driving. Teams from France, Spain, Belgium, the US, and Portugal will compete this weekend for the Cup as they build momentum to the World Championship in September. The landscape at Companhia das Lezirias is a favorite place for me so I had a LOT of fun. I know the place well, have friends there, enjoy the great restaurant ( A Coudelaria ) and it’s where friends stay when they come to visit me here in Portugal. I say all this just to give a nudge to you if you are considering a visit! I’ll be going back tomorrow and Sunday so come back and visit the blog next week. I hope you enjoy the photos. Oh, and the President of Portugal visited today along with the Minister of Agriculture for International Forest Day. It was a marvelously low-key event. Long before I became a photographer I was a lover of art. The Impressionists were my first love and though I have expanded my list of favorites to include the renaissance and Dutch masters, modern expressionists and a number of great American painters, I continue to return to the vibrancy and searching feeling that I see in much of the Impressionist’s work. Because of this it was a great pleasure for me to have several days in the South of France to take in the landscapes of Cezanne, Van Gogh, Bonnard, and many others. The artists were attracted to the light of Provence, but I think they must have been attracted to the shapes in the land. The fields in the valleys are covered in ancient gnarled olives and tiny, hardy grape vines. They mirror the twisted shapes of the olive trees in miniature. The miniature iris were blooming, hinting at the explosion of color to come. And the almonds were just coming out…the peach trees were in full bloom. 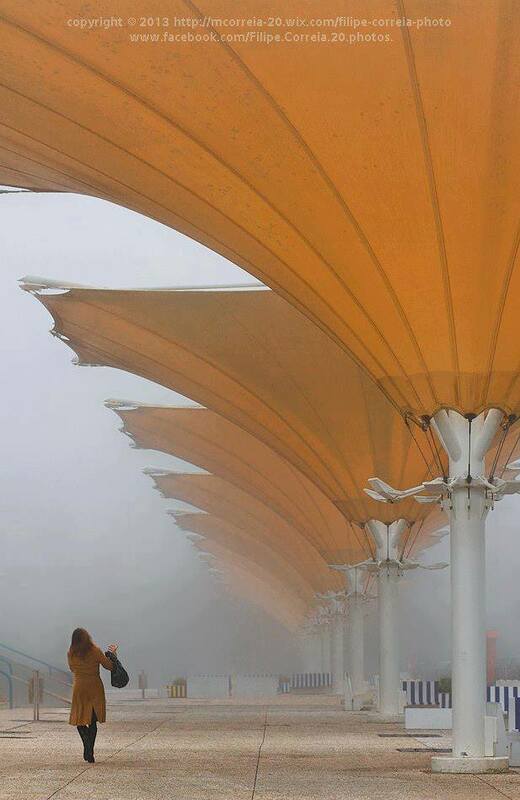 The weather here can be difficult; too hot, sometimes icy cold, often windy, ever changing. The wind comes from the north carrying moisture and cold, or from the south with a fierce heat, or from the East or from the West. Each of these Mistral (meaning ‘masterly’) winds has its own name. Basically, it’s windy. But the winds clear the atmosphere of dust and other matter and lend the luminous quality to the light. Think about what the light looks like on an early evening after a terrific afternoon thunderstorm. This is the light of Provence for much of the time. I visited the Chapelle Saint Sixte (12th century) on a calm evening without a cloud in the sky. This area in and around Eygalieres was painted many times by Van Gogh. I was happy to know that I was walking the same ground as the Masters…seeing the same forms…and seeking to create my own vision of this storied landscape. But that night my vision was a darker, more nuanced one….so I created the images below. I have just returned from a visit to the Czech Republic, Poland, and Germany. The day before I arrived in Prague for this last trip I learned of the death of Alice Herz-Sommer, the oldest known survivor of The Holocaust. In January I wrote about the gratitude for the inspiration I had received from reading her story and watching interviews and videos of her remarkable life’s story. I carried the inspiration with me while photographing again in Terezin (Theresienstadt), and later, in Oswiciem (Auschwitz). Sometimes it seems to me that sadness upon sadness and sorrow upon sorrow are all that remains. But that is not true. Mrs. Herz-Sommer’s infectious laugh, her twinkling eyes, and the joy she expressed in her music remain and will continue to inspire many more people. What remains for me? I think it must be gratitude. Gratitude that joy expressed during the darkest moments created enough light, enough hope to sustain one soul…and that one beautiful soul can inspire many others for lifetimes to come. 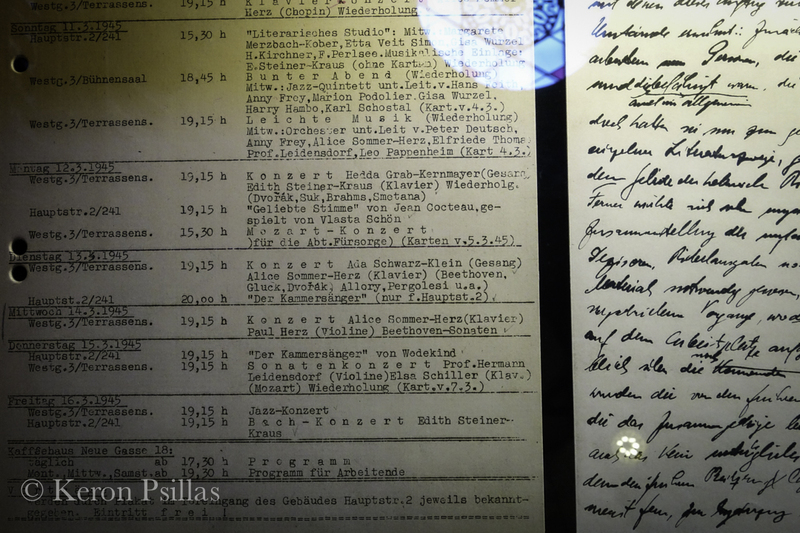 Photograph of an original program from Theresienstadt/Terezin listing concerts by Alice Herz-Sommer. The photograph above was made from materials exhibited in the Spanish Synagogue, in Prague. 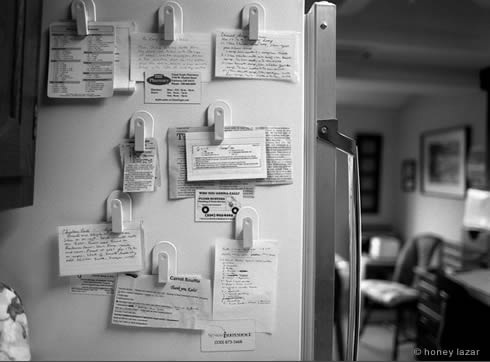 I am working on a project that is very important to me…though sometimes I despair at my seeming lack of progress. Every time I have felt a little lost, uncertain of my purpose or without hope, the Universe has given me a sign. It’s just a small thing, but enough of an encouragement that says ‘go on, there are things to uncover still’. Today, even while enduring a migraine, I picked up the laptop to check a few sites that always lift my spirits. But this day was different. Not only are my spirits lifted, but I stumbled upon another story that goes directly to the heart of the project I am working on. There is no mistaking the dual message: first, my quest is supported, and second, my hypothesis is correct. I am no different, no more or less deserving than any other person on the planet. But I have learned that when we follow our hearts, when we allow ourselves to be known and our intention to be expressed, we are supported. If you need a little encouragement today, open your heart…express your intent…and follow the signs. There’ll be much more to come about the project in this space, but for now, follow the link and enjoy. Life is beautiful. I am grateful. Thank you, Alice Herz Sommer. 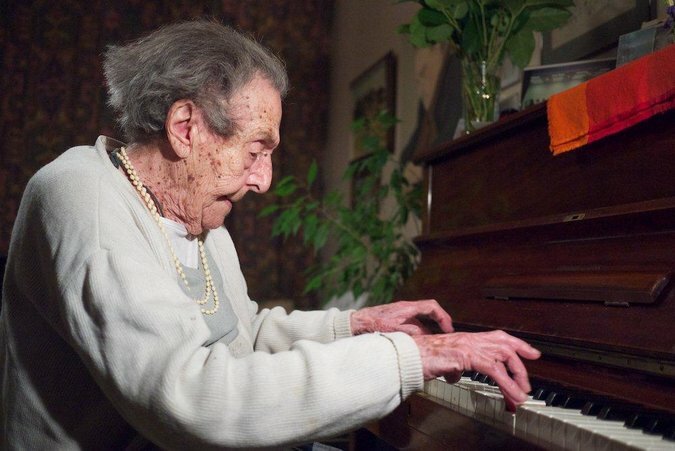 Alice Herz Sommer, mother, daughter, pianist, 110 and loving the beauty that is Life. It has poured rain for several days. A relentless wind makes sure it seeps through doors and windows and blasts down barn aisles. I find myself alone, far from family, mucking stalls in Portugal this Holiday Season. All the horse photography comes from a love of horses…and anyone that loves, truly loves horses, knows a lot about pitchforks and wheelbarrows. I’m adding to that knowledge bank now. While I do feel a little lonely I woke this morning thinking of how lucky I am to have this quiet time. I have had a lifetime of wonderful Holiday Seasons. I have lasting memories of warmth and family from my childhood. Favorite gifts of, surprise, horse books, stand out along with visits to and from beloved Grandparents. Even in the sixties there were epic searches for items on the “list”. My grandmother told me she traveled many many miles to find “Don’t Spill the Beans!” Years later I would enlist friends and my delivery drivers to find Power Rangers for my son. History repeats. The Holidays were about much more than gifts though. My favorite memories of all were the Christmas Eve concerts at church. I sang with our youth choir for years and during junior high I accompanied the choir on my flute. I grew up in the Presbyterian church. Ours was a great cavernous rectangle, devoid of decoration, but filled with light, old creaking pews, and in my child’s heart, spirit. My favorite song to perform? Do You Hear What I Hear? We sang from the four corners of the church…two groups on either side of the balcony and two groups on either side of the front of the church. I was thrilled to be part of the group on one side of the balcony. It really did seem as if our voices could reach the heavens and have the Angels echo our song. How lucky am I? The world is filled with people in the midst of violence, hunger, cold, and hopelessness. But I have memories of warmth and plenty and wonder. So I’ll be thankful for the opportunity to exercise, spend some time with horses and the unconditional love they offer, and absorb the glow from the warmth of years of happy memories. My hope is that you are doing the same or making more! And now it is time for me to go back to the barn, and my trove of memories. My memory of this time will be one of quiet but profound gratitude. Waiting for the signal to come one more step. My pony, Candy…with cousins, brother and sister. And my Mom, holding Candy. Waiting for the signal to get up and go…one step at a time. An early Christmas, age 2. The farrier and Candy, and my brother Paul. Yes, I am far too serious most of the time! Years later, Christmas with Ian…and a tree that would get larger every year and covered with ornaments. November…not for the faint of heart! Wow! It has been an action-packed month! On November 1st, my latest book arrived. 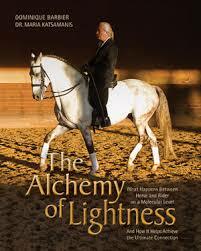 The Alchemy of Lightness was written by Dominique Barbier and Dr. Maria Katsamanis and includes 40 of my images in large format. I helped with the editing of this book over the last several years so it is with great joy that I can say it is now available! Click here to order your copy. It has been very well received. Thank you once again to Martha Cook, Rebecca Didier and all the team at Horse and Rider Books! You can see all their catalog of fabulous books by clicking on the button to the right! Then on November 3rd, I had the great pleasure to give a lecture at InVision Photo Festival in Bethlehem, Pennsylvania. The talk was very well received (I was invited back!!!) in a gorgeous venue. I was a little nervous of course, but once I get started talking about my passion for photography I am difficult to stop! It was also fabulous to see old friends and students from the Banana Factory where I taught several workshops in 2009 and 2010. Thank you Janice Lipzin for the incredible opportunity! You have created a wonderful event that shows your professionalism as well as your passion. I flew that night to Portugal to host a group of ladies for two weeks. They came to enjoy the Lusitano Festival that happens each year in Golegã. We enjoyed great weather (a welcome change) and spectacular events. Along with the horses we visited some cultural sights and then went to Pedro Torres’ barn for four days of intense training! See the link at the top of this page for a fuller description of the trip…and scroll down to see some more images. It was so good for me to share the parts of Portugal that I have come to love. Already looking forward to next year! After the trip was over I flew to Prague to continue work on a personal project of mine. I’ll keep those details for another post, but I did find the PERFECT music to accompany the work I am doing. Prague is a city filled with all the arts, but especially music. https://keronpsillas.files.wordpress.com/2013/11/01-hebrew-melody.m4a Wait for it to load…it’s worth it! 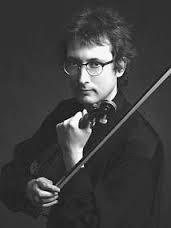 Alexander Shonert has very graciously given me permission to use his music for the launch of the project. More about that soon! But go to his website for more beautiful melodies and stirring performances! And now I am back in Portugal, catching up on image editing, blog posting, and emails. I have posted a new page (see above) that outlines a Mentoring program that I began this past August. It has brought me so much satisfaction and affirmation. Throughout my career as a photographer I have been the beneficiary of the best teaching in the world. It is an absolute honor to give this back to my students. Check it out if you are interested in advancing your skills! I wish you all a joy-filled Holiday Season! Now…almost time to switch on the snowflakes. (Readers of this blog may remember this…) From a warm, palm-tree silhouetted evening in Portugal….thank you for checking the blog! Following five wonderful days at Golegã enjoying the Lusitanos and the festive atmosphere, my ladies were ready to ride! For four days we had the privilege of riding and learning from a number of Senhor Pedro Torres’ horses. Ulisses and Trinco (European champion this year with Bruno Pica) taught the ladies the feeling of the upper level movements including 2-tempis, piaffer and passage. The weather was perfect along the shore in Cascais. Perhaps a little breezy one day, but sunny and bright. We were also treated to a demonstration with retired world-champion Oxidado and Pedro’s new star Ahoto. Everyone remarked that it was tremendous to see the capability and athleticism of the Lusitano in full display. This seemed to be the theme for the entire trip. Everywhere we went, whether at the Portuguese National School of Equestrian Art, sitting on Carlos Oliveira’s exquisitely light Botero and Talismá, or watching Ana Batista try new mounts for Tauromachie, we marveled at the horses. 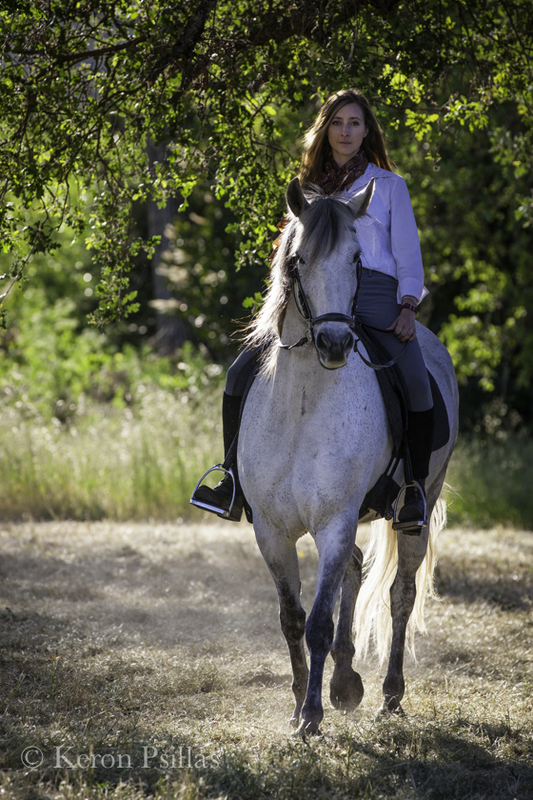 The Lusitano’s unique ability to offer brilliance and strength while maintaining a calm and willing attitude is the quality that engenders the great respect for the breed. There’s always a Jack around the barn! I am woefully behind with my blogging. So in order to catch up I will begin with a fun subject: Golegã, the Lusitano Fair that happens every year in November. I was host to seven marvelous ladies this year who were eager to soak in all the pageantry and excitement that the Fair brings. And of course, they are all lovers of the Lusitano! 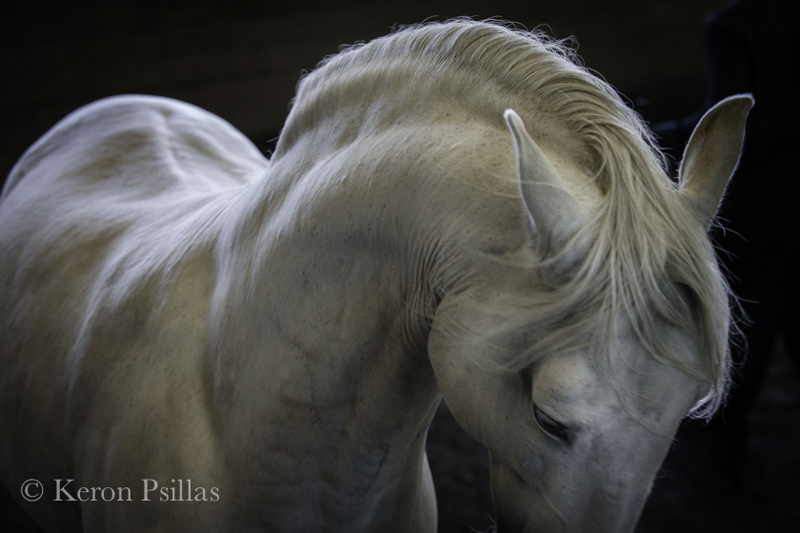 We began with a trip to visit Carlos Oliveira and his gorgeous Lusitanos. After some tack shopping at Mundo Equitacao with Catia, Maria Joao, and Maria Helena, we made our way north to our lodgings. For the first six days of our trip we stayed at Ourem Castle, in the Pousada and at Casa Alta Royal Lodge. Both are highly recommended! The sights and sounds of Golegã must be experienced to be believed. There are horses everywhere, of all levels of breeding, training, and turnout. 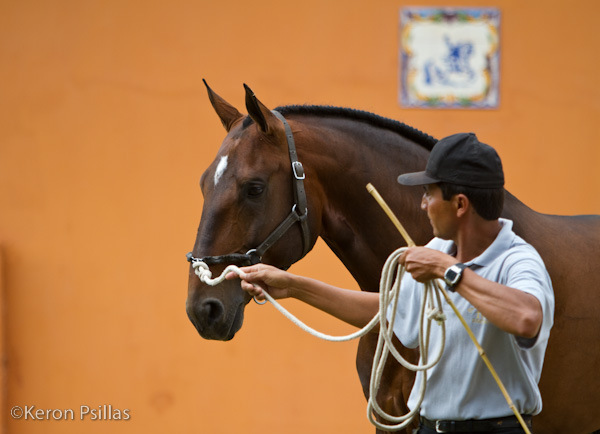 But the strongest impression is one of a shared love for the Lusitano, this National Treasure. Riders in traditional dress complete the picture of this elegant animal. As the day lengthens into night, the sounds get a little louder and the Ginja flows a little easier! It is, after all, a festival! But it is also a competition. Congratulations to all the breeders. The classes this year were super competitive! Though my ladies were keenly interested in all things Lusitano, we did make time to visit some local cultural sites, including Tomar and the Convento do Cristo. It’s just one of many UNESCO World Heritage sites in Portugal…but probably my favorite. The mysterious history of the Knights Templar and outstanding architecture examples culminating in an explosion of Manueline style captured everyone’s imagination. After our week in and around Golegã we went to Cascais for a four-day riding intensive with World-Champion Working Equitation rider Pedro Torres. More about this amazing experience in the next blog. 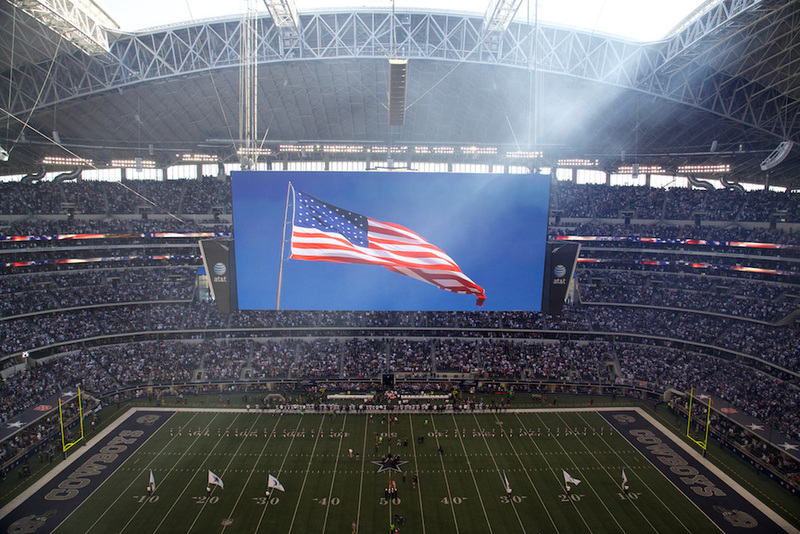 Until then….enjoy the photos from the first week! And if you look under November 2011 on the list of posts to the right, you’ll see more images from Golegã. Thanks for checking the blog! Carlos Oliveira winning the 3-year-old Lusitano stallion class with 19 tough competitors! playing in the light & a gallery show! I am happy to say that I am back in Portugal for several weeks. I’ve been feeling a little ‘down’ about not photographing enough, so I did something about it! Photographing in an indoor arena is always tricky. And knowing we were going to visit Senhor Manuel Braga to photograph horses in his picadeiro gave me more than my usual apprehension. I remembered that the footing in this particular arena is nearly black. Oh well….nothing to do but try! When I arrived I had a big surprise though…just the week before, Manuel had replaced the footing and now there was a lovely white reflective floor! It was late in the afternoon so the light was slanting and a little warm. Horses were presented and ridden and photographs were made. I was generally happy with the result when in came a gorgeous young black stallion. Manuel turned him loose for me to photograph him in liberty, saying “he is very expressive”. This was an understatement! The horse was a fabulous mover and he loved playing with Senhor Braga and Pedro. I was a very happy photographer. There are some straight shots, a black and white conversion, and two with my favorite Flypaper Textures! Enjoy….more from the last several weeks coming soon! If you are in the West Virginia/Maryland/Virginia area, there is a great photography show coming up in Martinsburg at the newly minted Berkeley Art Works: October 3 through October 27 in the gallery at 116 North Queen Street. I’ll be showing proudly but humbly with Mark Muse, Frank Robbins, Rip Smith and Robert Clark. I’ll miss the reception, but just manage to see the show when I return to West Virginia after some work in Brasil! I can’t wait. My fellow photographers have taught me a great deal and I am a big admirer of their work. Passion for learning, for printing, and capturing the light unite us though our visions are wildly diverse. Go see the show! 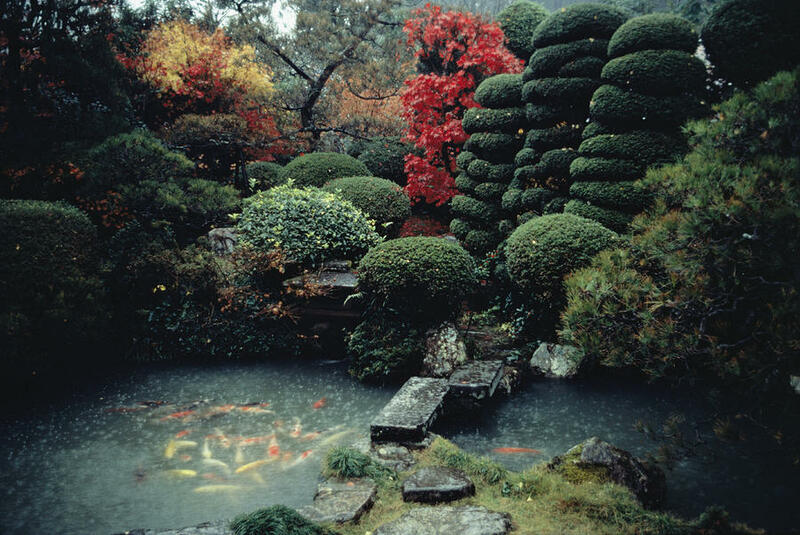 Click on this link for a great interview with my friend and mentor, Sam Abell. And here’s another: Story Matters. Thank you to Jonathan Blaustein and Story Matters for the interviews. And thank you to Honey Lazar (click this link to see her amazing project, Loving Aunt Ruth, along with a stunning body of work) for bringing the first to my attention. I continue to be inspired and stunned by the creativity and quality of photography being produced around the globe. This week I came across a great Street Photography site (on Facebook) that has me itching to shoot in Lisbon. My biggest question is how do I fit it in to an already overloaded schedule? I struggle with this each day while remaining grateful for all the opportunities that stretch out before me. Enjoy these links…I’ll be back in a few days with a discussion about a portrait series….stay tuned…and go make some photographs! Oh! one last one: David Alan Harvey interview in Vice. Here’s the link to David’s burn. online magazine. 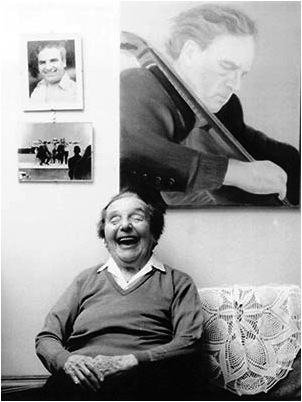 One of my favorites from Honey Lazar’s Loving Aunt Ruth project. I have had a great experience this week! I’ve been preparing for and then attended my show at The Bridge Gallery in Shepherdstown, West Virginia. As with any big endeavor there are usually a number of people involved. I have much to be thankful for and I’ll begin with Mark Muse. As I am just returning from a fabulous six weeks in Portugal, I asked Mark to help me by making the prints. He is an extraordinary photographer and a masterful printer. See the images below for how he was able to make my photographs sing! 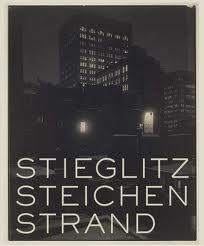 Then go and check out his work for a master class in restraint and subtlety! Kathryn Burns, gallerist and proprietor of The Bridge Gallery was sensitive, patient and encouraging the entire time. Kathryn, THANK YOU for making a dream come true. Having a show at The Bridge Gallery was a ‘big deal’ to me as I have attended numerous shows there for artists I revere and who have inspired me for many years. Jim Kline, Michael Davis, Mark Muse, Tico Herrara, Hali Taylor, Frank Robbins, Rip Smith, Benita Keller, and Charlie Shobe are just a few of the names that come to mind. I’ve had wonderful teachers and artists to emulate for a very long time. This community has given much to its artists and art-lovers and they turned out again in force last night! Hundreds of folks enjoyed the show on a perfect spring evening, which was great as many had to wait outside before there was space to come in. The best thing for me about the show? Listening to people describe their reaction to the work and the thoughts and feelings it evoked. I’ve often said that when I make a successful photograph I am blessed three times. First, the experience of seeing it creates a thrill. Second, the confirmation that the image is good (technically) aside from the emotion of making it, gives a feeling of satisfaction and affirmation. Third, when a photograph elicits a response from a viewer (and I am lucky enough to know about it) the understanding and communication that arises is a very special moment for me. Humbly, I had many of those moments last night. The joy I am feeling will keep me going, keep me seeking refined and subtle imagery for a very long time. Thank you to all of the people that took a moment to speak and share with me last night. The show is up until May 5th. I hope you’ll stop by if you are in the area. And as an extra special treat, you’ll see the lovely work of Isabelle Truchon! Her oils and assemblages are uplifting and engaging. Here are some wall images from The Bridge Gallery. Thanks for checking the blog! I know it’s been far too long between posts. Landscapes, Prairie Creek, bottom, and Delaware Water Gap, top. Every once in a while I enjoy looking back at images in the archive. I thought it would be fun to play with Flypaper Textures on some old favorites. I think it’s useful to examine old images from an emotional distance. I often tell students that the best time to edit is at least a month from the time you made the images. Yes, we all have to look at them as soon as possible…but don’t throw them away for at least a month or more. When the emotional energy/heat has faded we can begin to see our images much more objectively. It doesn’t matter how far we had to climb or how long we had to wait or what light we had to battle…the image must stand on its own merit. That may sound strange coming from me in a post about texturing and layers. After all, it is image manipulation. But here’s the caveat: a bad image will not make a great textured image. Start with a good photograph and then enhance the image in a way that amplifies a concept you are trying to communicate. When I am photographing I am always thinking about communicating what intrigued me, what made me care enough to stop and create images. Then, if the image can be enhanced with textures or layers, then I think about those qualities again. Perhaps I felt a somber mood or a mysterious brooding atmosphere. Maybe I just felt the image was going to be painterly and planned right then to add textures. Its likely that if that was the case, I photographed in order to support that intention. Here are some old favorites re-invisioned. I’d love to hear your thoughts! 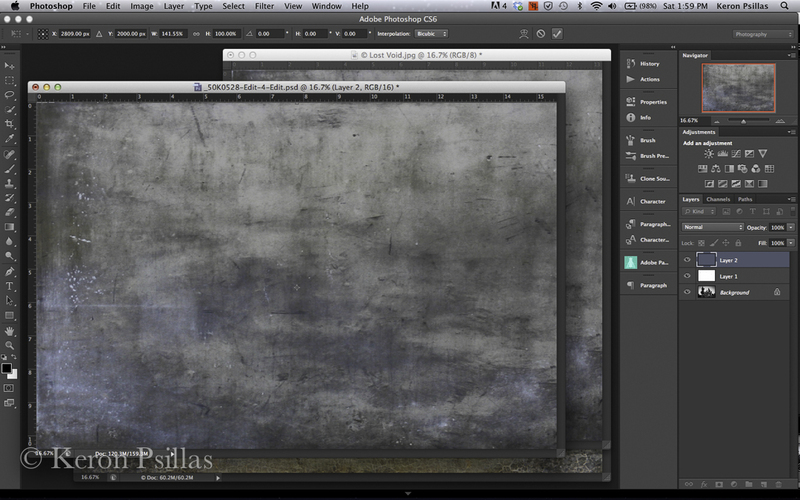 Leave a comment if you want to learn more about using textures and layers. Have fun with your images (and CLICK MY BUTTON….over there on the right…for Flypaper Textures)! I was captivated by the light and play of shadows in this ceiling. It’s a small building but it felt so expansive. The best-preserved Templar building in Europe is the Convento do Christo. This fountain is from the 16th Century Courtyard. The building dates from the 11th Century. Moody, quiet, contemplative, eternal. That’s what I saw. This stallion had such a noble look about him. I wanted to amplify the ‘old world’ feel. Pre-dawn, no possibility of a sharp shot….so, pan and defocus. I wanted a timeless feel in a Parisian image. So I waited for the right person to walk into the frame on the right. The blue and gold tones complement each other and the eye held my interest. I had to sense the yellow leaves and white trunk. 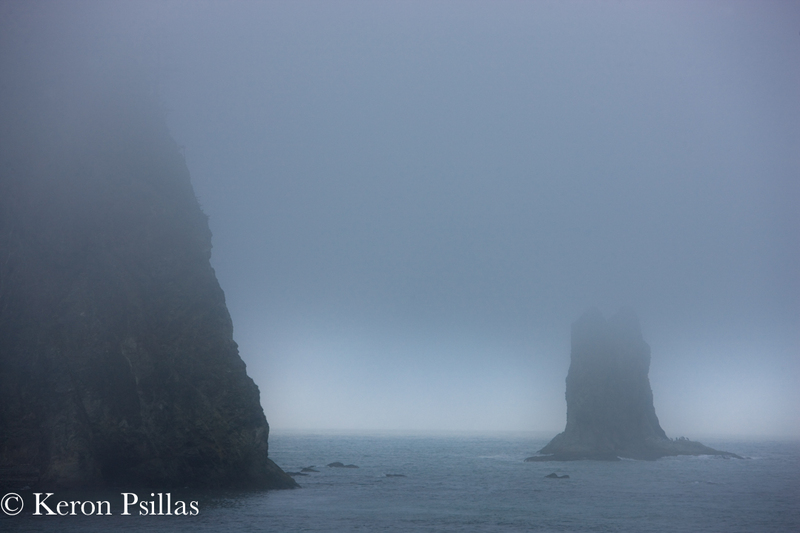 The fog was so dense and the sun had not risen. It became my favorite image that year. I’ve been blessed to live with magnificent trees throughout my life. 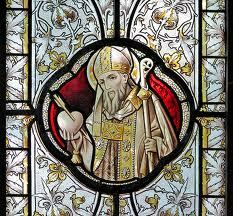 As a child my world was bounded by a great maple for climbing, an ancient half-shattered walnut, and a pear tree that brought wasps in summer to devour its decaying fruit. There was also a great cedar tree that was home, periodically, to Stanley, and later, Ethel. These were blacksnakes that terrorized my mother, were pets to my father, and mysterious challenging beings to me. Later I lived on the side of a mountain adjacent to the Appalachian Trail. The vast forest was sheltering and nurturing. Terms like BTU’s, cord, cured, and standing dead became important to a household that heated primarily with wood. But the woods also held mystery, challenge, and triumph for two growing boys. A mighty oak stands sentinel in what was my backyard for the fifteen years I lived on my farm in Shepherdstown. I watched it spread its canopy and offer its shade, increasing each year until it covered what once was a bed for sun-loving lilies, bee-balm, and peonies. Summer evenings brought dinners outdoors. Candlelight and dancing fireflies from its branches illuminated the smiles of guests faces. Heavy mast years warned of big snows in the winter and the yard would become a feeding ground for far too many deer and squirrels. But the animal I enjoyed most was a club-footed crow that sat on a branch near my bathroom window. He cawed at me for years, especially during winter months. Listen! he said. Listen to the moonlight make its way through the branches and the crinkly soft crunching of the snow. Listen to the quiet. I live now in a land of cork oaks and olives. What they lack in stature they trump all others with their history of partnership with the land and its inhabitants for several thousand years. The rhythm of life is largely unchanged for the people that harvest the olives and cork. I’m enjoying it visually. But I am also in-tune with this rhythm and what it means to live by the seasons. I’m going to write more about this in my next blog. For now, here are a couple of tree pictures from many years past, and a few I made two days ago. Enjoy. A dear friend from home keeps me updated on the Sycamore near the railroad and the mighty oaks at the turn at Hendricks farm. I hope you have special trees in your life too. I have been thinking all day about what to write on this last day of the year. In the midst of thought I received a note from my from my very dear friend, (and super-amazing photographer) Honey Lazar. She shared a link for her latest blog on Loving Aunt Ruth. I had the great pleasure to see the Four Classical Schools Exhibition in Paris again this October with the Barbier Farms group. I was there for the first performances in 2007 and to return was great fun! Overall, I thought the show was engaging, beautifully staged, and perhaps the choreography was a little more interesting this time. The Spanish Riding School from Vienna gave a lovely, tranquil performance, the Royal Andalusian School of Equestrian Art was exciting and the Pas de Deux was a crowd favorite, the Cadre Noir from Saumur was gorgeously turned out and gave a thrilling jumping exhibition and stunning Quadrille, and my favorites, the Escola Portuguesa de Arte Equestre were regal and classically tactful. So, Kudos all around! Just before we left the South of France for Paris, we went to visit Frederic Pignon and Magali Delgado. Frederic and Magali were the original performers and choreographers for Cavalia. We spent nearly an entire day with them and were treated to a wonderful impromptu performance at their house with many of their horses. Then we had a visit to their breeding farm with a surprise champagne reception in the field with the mares and babies. Their warmth and hospitality was matched only by their love and respect for their equine partners. Thank you, Frederic and Magali, for this marvelous gift.